Sure you can ignore that whining dog who just had dinner but is crying for a peice of your food but try ignoring a weeping anteater. 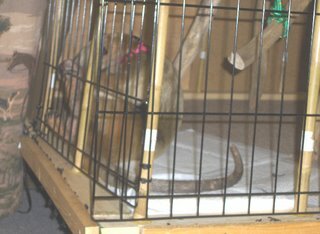 When we first got Pua she was very upset and would give one long hiss followed by a bunch of short ones. She was threatening us but also crying. The other day was very bussy at the shop got a shipment and then Pua woke and I showed her off to the driver before he left then she got fed and went to sleep in my lap. 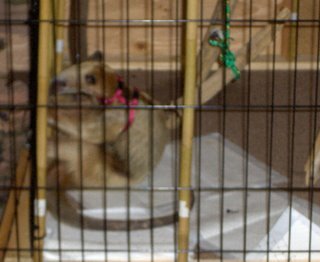 So I set her on the chair and went to change her cage to the new kennel wiring that was in the delivery. She woke before I was fully done but enough that I put her in the cage while I finished. She was okay following me around from the inside then I had to do a few things. 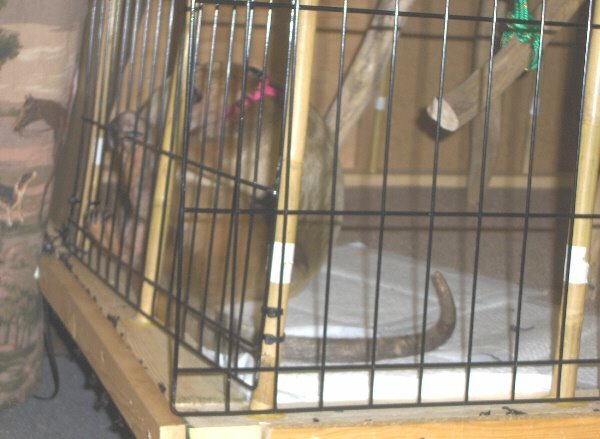 Looked over and she's currled up on the bottum of her cage clinging to the bars. Got a pic but then when I got close she was crying. Big breath the "ss ss ss ss" If she could produce tears I'd be in even worse trouble. Not sure why she was so upset usualy she just runs around looking for a way out to get to me. the new caging must have confused her. Got her out and after a cuddle she was fine.